The Bulgarian midfielder Hristofor Hubchev joined his current team, Larissa (Greece), in January 2018. Until now, Hristofor Hubchev has been present in twelve games. Having been born in 1995, on November 24, his age of 23 makes him junior to the average player of Larissa. 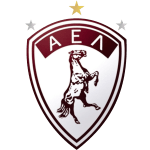 In Super League (Greece), Larissa is in tenth position and in Greece Cup (Greece) of group Gr. 8 they are in second place. Measuring 181cm, Larissa's average player height succumbs Hristofor Hubchev by 3cm. 46% of Larissa's football players are left footers and so is Hristofor Hubchev. Six months was the stubbiest period that he was contracted to a team (Bonner SC from Germany) Larissa's jersey number 23 is Hristofor Hubchev. So far this season, he tied 50% in Super League and won 67% of Larissa's matches in Greece Cup. They also managed to win 2 fixtures in a row in Super League. While being substituted more out than in this season, the contrary occured the year before. However, he shows ten out and ten in substitutions in total. Before joining Larissa, Hristofor Hubchev impressed at Bonner SC, Beroe Stara Zagora, PFC Montana 1921 and FC Dunav 2010. He reached the 78 appearances milestone as a professionl, the last one being 121 days ago. Already 21 times a card was given to him in his tenure. The longest period that Hristofor Hubchev stayed in a team was one year and 11 months in PFC Montana 1921 (Bulgaria) He is playing as midfielder in Larissa together with Lefteris Bamis, Noe Acosta, Kenan Bargan, Panagiotis Ballas, Alexandros Chalatsis, Nikos Golias, Leozinho and Adnan Secerovic. A PFG 15/16 (Bulgaria) has been his best season so far since he played the most matches in his career. Weighing 165.35lb, Hristofor Hubchev measures 2lb less than the average player on Larissa.